Well with the winter setting in here at Texoma, fishing has slowed down. I finished a trip this saturday, a real pretty day, with a group of seven, who limited out with lots of good fish, and a great time. They also noticed I get real comical when getting near our limit, and heading in. All-in all, this year has been real great. I have met a lot of new friends and closed out with lots of old friends (Riha) who always fish around thanksgiving, and they will be sending some extra pictures soon, on their great catches. 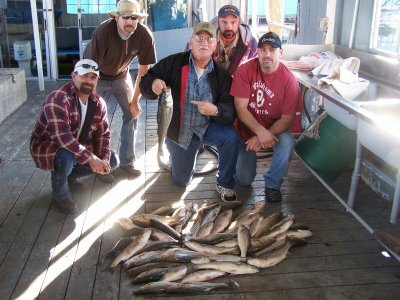 We had our limit early, and therefore Bob calls it his half-day trips. (lol) The fishing is still good, but slowing with cold weather, so unless you like to fish in cold weather, have a great Christimas and Happy New Year. "JD"
Next Next post: Reward – Accident Information McKinney, TX.